DENVER, CO. (October 12, 2013) – On Oct. 12, thousands of activists in Denver and surrounding areas will converge at the State Capitol at 11:00 a.m. in solidarity with the millions of activists from around the world, who will once again March Against Monsanto, calling for the permanent boycott of Genetically Modified Organisms (GMOs) and other harmful agro-chemicals. Currently, marches will occur on six continents, in 52 countries, with events in over 400 cities. 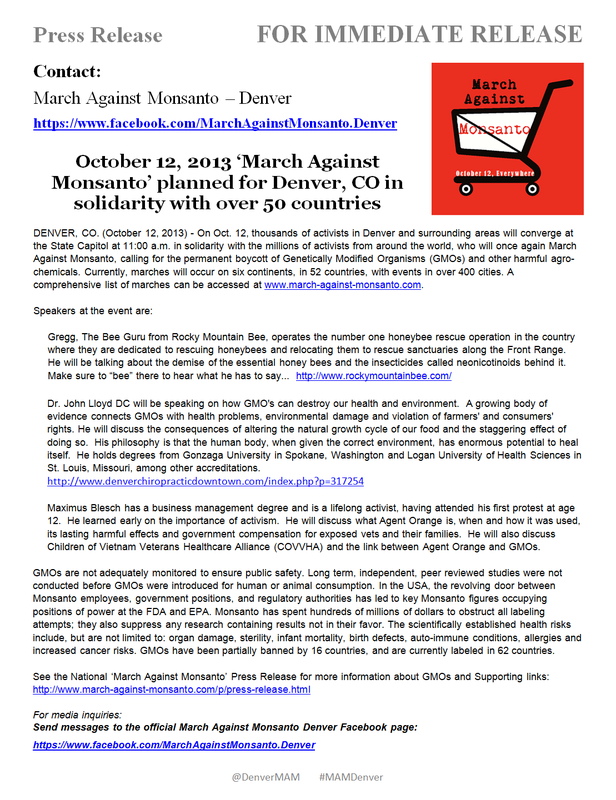 A comprehensive list of marches can be accessed at www.march-against-monsanto.com. Maximus Blesch has a business management degree and is a lifelong activist, having attended his first protest at age 12. He learned early on the importance of activism. He will discuss what Agent Orange is, when and how it was used, its lasting harmful effects and government compensation for exposed vets and their families. He will also discuss Children of Vietnam Veterans Healthcare Alliance (COVVHA) and the link between Agent Orange and GMOs. GMOs are not adequately monitored to ensure public safety. Long term, independent, peer reviewed studies were not conducted before GMOs were introduced for human or animal consumption. In the USA, the revolving door between Monsanto employees, government positions, and regulatory authorities has led to key Monsanto figures occupying positions of power at the FDA and EPA. Monsanto has spent hundreds of millions of dollars to obstruct all labeling attempts; they also suppress any research containing results not in their favor. The scientifically established health risks include, but are not limited to: organ damage, sterility, infant mortality, birth defects, auto-immune conditions, allergies and increased cancer risks. GMOs have been partially banned by 16 countries, and are currently labeled in 62 countries.